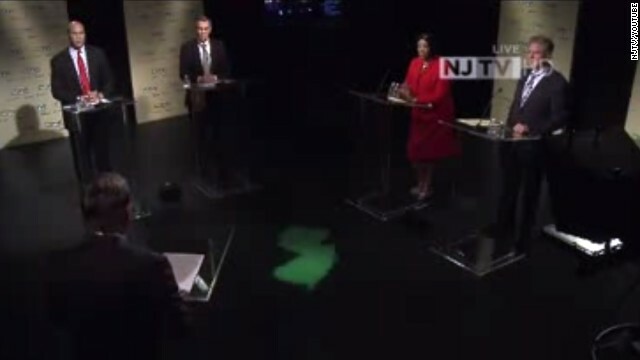 (CNN) – All four Democrats vying for a spot on the ballot in New Jersey's special U.S. Senate election debated for the first time Monday, revealing similar stances on foreign policy but disputing Newark Mayor Cory Booker's record on education. The winner of the August 13 primary will go on to compete in an October 16 general election contest, which was called after the death of longtime Sen. Frank Lautenberg in June. Booker, who did not attend previous Democratic debates, went up against U.S. Reps. Rush Holt and Frank Pallone, and the speaker of the State Assembly, Sheila Oliver. Public polls have consistently shown Booker as the frontrunner, and in hypothetical general election matchups with Republicans, he also wins handily. Booker has raised some serious cash already this summer, with $6.5 million raised as of June 30 and $4.5 million in the bank. He'll be getting even more money Thursday night when Oprah Winfrey hosts a fund-raiser for the Senate hopeful. During Monday night's debate, the rival candidates largely avoided landing any hard punches on Booker, though at the debate's outset, Holt took a swipe at the Newark mayor's national profile and well-publicized city heroics. "I've never run into a burning building, I don't know Mark Zuckerberg, and I don't have more than a million Twitter followers," Holt said. The candidates also took aim at Booker for his management of Newark's city schools, which have been under control of the state since 1995. Under an agreement between Booker and Gov. Chris Christie, a Republican, the state maintains legal control over the district but authorizes the mayor to develop a comprehensive education plan. Zuckerberg, the billionaire founder of Facebook, donated $100 million toward improving Newark schools in 2010. Oliver argued that under Booker's watch, schools in Newark have continued to suffer. "We have not seen improvement with state intervention. There is no question the difficulty with large urban districts is the politicization with the schools," she said. Pallone pointed to Booker's support for Christie's education plans, wondering how state control of the schools was impacting students' education. "What is the real impact?" he asked. "What does that mean in terms of how they want to influence what happens in the schools?" Booker defended himself, saying he'd "never ever apologize for bringing hundreds of millions of dollars to help poor kids get a good education." He said later that the next U.S. senator from the Garden State would need to work with Republicans to get anything significant done in Washington. On other topics - including U.S. intervention in Syria, and competition with China - the candidates expressed largely similar positions. But on National Security Agency snooping, Holt and Pallone argued for more robust changes to the way the federal government collects data on Americans. In an ad Holt's campaign debuted Monday, the eight-term Democrat went after Booker from the left on issues such as NSA spying, which he said Booker was waffling on. "Cory may be the frontrunner in this race, but he's no progressive," Holt says in the spot. I haven't heard enough from any of them. As someone who lives in the state, my thinking is who can best defeat the Republicans who want to roll back too many of the things that help people like SNAP and health care reform.